Welcome to American Ballet Theatre, the premier classical dance company. If this is your first visit, please take a moment to fill out our visitor's log before leaving our site. Use the Site Contents Page for help if you're looking for a specific interest. ABT National Tour Schedule. When will we be coming to a city near you? Tour dates, theaters, ticket information, casting. What's New at ABT. The quickest way to find out what's happening at American Ballet Theatre, including premieres, special events, new programs, classes, and links. Meet the Dancers. Want to find out more about your favorite dancers? This is the place to be. The Ballets. What is the story behind Swan Lake ? Who composed the music for Cinderella ? That is what this section is about. Company History/Information. 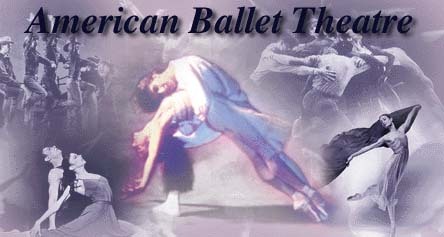 We would like to introduce the history and people that make American Ballet Theatre what it is. Make a Difference. ABT relies on the generous support of individual ballet lovers like you to keep us dancing. Join us -- it can change our world and yours! The Photo Gallery. Browse the gallery to view photographs from performance and rehearsals. American Ballet Theatre would like to thank Ernst & Young LLP for generously underwriting this site. This site was designed by Tamara Barden for Netscape. for hosting and partial sponsorship of this site. This site was last updated on 6/23/96.